The church has a language problem. No, it isn’t because pastors are swearing from the pulpit. The issue here is with words that life long Christians may understand, but many in the unchurched, dechurched, or in-church-but-checked-out culture don’t. Indeed, whether it’s mystification, misunderstanding, or miscommunication, many of us struggle to communicate the good news of the Gospel in our preaching, teaching, and evangelism. Heather Choate Davis and Leann Luchinger, in their new book Loaded Words: Freeing 12 Hard Bible Words from their Baggage, pay us all a favor by detangling religious words that are difficult for to understand. Unpacking words like “repent” and “religion,” the authors help restore truth where popular opinion and perception have threatened righteous reality. We might take their cue and try unloading emotion-laden and negatively charged words that our communities, friends, or family may simply not like to hear, or misunderstand when they do. The book is available exclusively on Amazon as an e-book or paperback. Having already spoke at congregations in Washington, the authorial pair will be speaking in the Phoenix area in February and headed to New York in the near future. Check out their website for more information on booking them for your church or organization. For now, let’s unpack Loaded Words a bit with an in-depth interview with Davis and Luchinger. How can this book help the local church? Davis: With so many outside influences jockeying to define Christianity and its message—and not always thoughtfully or accurately—we’re not just talking about a knowledge gap that needs filling, but a vigorous and intentional reclaiming of original meaning. We hope that pastors will welcome the help with some of this much-needed translation work—both exegetical and cultural—of words that people both inside and outside of the church no longer know the true meaning of anymore. 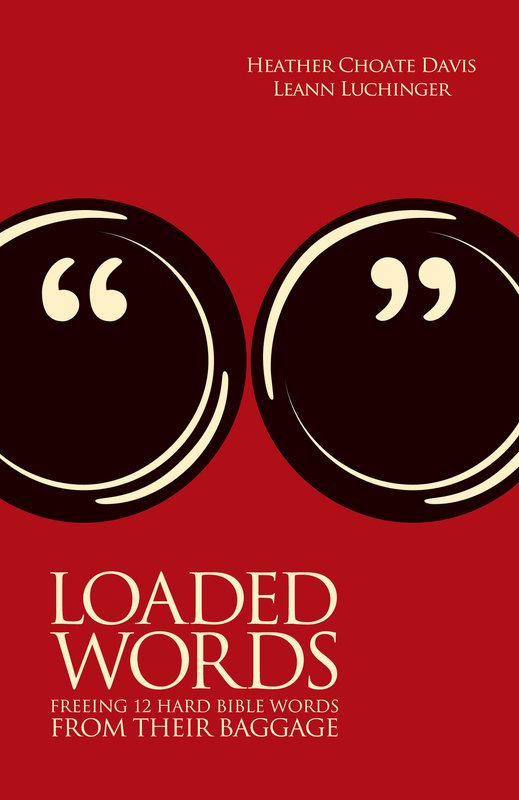 Luchinger: To paraphrase from the back cover of the book “no one wants to be part of an old mean-sounding religion.” Loaded Words gives “seasoned” believers a new way to think about how to share, and even some words and concepts to use for themselves. For newer believers, Loaded Words can help them unpack some difficult concepts. Davis: We’ve essentially bankrupted the notion of a man’s word as “sacred.” Thoughtful people of all traditions recognize that this is no way to live. In the wildly popular Toltec spiritual treatise The Four Agreements, the first is “Be impeccable with your word.” Notice the choice of the word impeccable, which shares the Latin root pecco with the word sin. Luchinger: Semantic change/shift/drift is the more technical way to describe a word that has completely changed it’s meaning from the original definition and use. In the culture we batter words around, using, misusing, and misappropriating them because of coolness factors, or desire to have something (at least the same title) that other people have. If being “bad” is suddenly good, well then call me “bad” – or so it seems. Church words, unfortunately, seem to move in the opposite way – from good to bad. And sadly, it is the words of Christians themselves that, many times, do the most damage. These words that are meant to have a depth of meaning and emotion, offers of explanation and grace, are losing their definitions. Semantically shifting in the wrong direction. We Christians have to reclaim the Christian conversation, the Christian words, the expressions of our faith. Which was your favorite chapter? Why? Author Heather Choate Davis shares how, "[w]e are all bombarded with words/messages from culture" and some of them need unpacking and reloading. Luchinger: Given the current state of the “Church,” I think this word could be particularly helpful for two reasons: 1) those inside the church could perhaps use an attitude adjustment about what it means to be God’s gathered people. A family, filled with flawed souls, with plank-filled eyes, with pain and distress, and bad days – just like the people who share our sir names; 2) for those inside and outside the church it is a reminder that we don’t need four perfect walls to be a church. We can worship in buildings and homes, in coffee shop churches and college dorms – it is the Word and Sacraments, the body of believers, the gathering of people that make the church – not the bricks and mortar. Davis: We are all bombarded with words/messages from culture. Even if a pastor knocks it out of the park on Sunday, that brief message will likely have been drowned out in a day or two by news, work, social media, noisy children, and a thousand competing interests. The teachings of Jesus are simply not the dominant voice in the culture, but we know that He is present in all ways, in all settings, at all times through His Word and His people. To me it all comes down to the lesson of Pentecost, “that each one heard them speaking in the native language of each.” If pop culture is the native language of many people today, then we who seek to connect need to speak in their native tongue. If referencing Family Guy, Game of Thrones, or Fifty Shades of Grey, helps people understand the message of grace in a new way this does not diminish the Gospel, but rather, makes good on its purpose. Luchinger: I would love to understand where Wittgenstein draws the line between feeling and truth. It appears, based on your description, that feelings have no bearing on truth. Thus love, for him, could not exist because it is a feeling. It reminds me a bit of Lois Lowry’s book The Giver. In this utopian society, feelings were of no use – precision in language was modeled, practiced, and expected. The Giver, the wisest man in this society, bore the burden of holding all historic memories that might cause emotion – protecting the people it would seem, from disruptive truths. Predictably, this utopian notion eventually fell apart. As the saying goes, “better to have loved and lost, than never to have loved at all.” Emotions give truth its vigor. What words did you consider and not include? Any that you thought of later or have been told you should have included? Davis: People kept saying “spiritual,” but I was always adamant that spiritual is not a loaded word. Spiritual is a softball word that we’ve come to use in the culture to mean we aren’t opposed to the idea of some sort of supernatural power, and it could be God, and yes, we would certainly want him on our side if it came to that, but we don’t believe we should define it too rigidly, and we don’t really practice or pursue it in any significant way. No one cringes when you use the word spiritual, which is why people use it. When we talked to pastors early on they all assumed we were going to write about words like “sanctification” and “justification” but those aren’t loaded words either. No one in the culture has any idea what those words are so they certainly don’t cause them any grief or confusion. Leann Luchinger reflects that, "We Christians have to reclaim the Christian conversation, the Christian words, the expressions of our faith." Davis: The Loaded Word that I unpack for people most often is Sin, because that’s what I did my thesis on. On Homo Incurvatus in Se—Man Turned in on Himself—as and entry point for the discussion of sin in the 21st Century. When I speak on the subject, I use my hands a lot to describe how we get when we are turned in on ourselves and how this connects to our modern day enslavements—anxiety, depression, a disordered relationship to technology, a broken sense of vocation/purpose. I can see people in the audience physically mirroring what I’m doing, and so I know the ideas are really resonating with them in a profound way. Icktank Press is actually publishing the thesis work now so it can be more readily available to people. Man Turned in on Himself: Understanding Sin in the 21st Century will be out by the first of the year. Luchinger: I recently spoke for a mom’s group and connected the time and care we put into teaching our children about our favorite sports teams to the time and care we need to give to their Christian faith. When our children are small, we dress them in jerseys and teach them to join us on the couch for the “big game.” We teach them about field positions, top players, strategy, who to root for and who to boo. We discuss and debate and learn and grow in sports appreciation. And as our children grow, they “own” their own version of fanaticism for the team. They root for the family team, they debate with their friends, decide which strategies and players they like best. Isn’t this how it should be with Christianity? When they are young we nurture and teach, as they grow we dialogue, debate and discuss – all so that our children can go out into the world and “own” their faith. How did working together as co-authors make this book better? What were some of the challenges? Davis: The strength in the book is absolutely rooted in the partnership and the hundreds of hours of conversations we’ve had about these words, orthodox theology, and the challenges of translation/communication. We aimed to put forth positions that were “clean” theologically, but also “clean” of connection to any particular political/social agenda. We both feel that this type of “noise” has been highly detrimental to the faith. Luchinger: Heather and I both have our specialties – or gifting – in the area of research and writing. We like to explain it this way: “Heather is the Poet, Leann is the Farmer.” I like to dig, and uncover, and mine for the original context and meaning of the words. The research drives me. Once I was satisfied that I had a strong sense of a word, or at least a good notion of how thoughtful theologians were unpacking the meaning, I would send my research to Heather and we would dialogue about threads and directions. Sometimes when things got sticky, or I thought we’d lost our way, I would go back to research a bit more to see if I could find just the right theological explanation or phrase to help us out. It is interesting, every time we really got stuck or disagreed about direction, the chapters seemed to get better.